Definition at line 3033 of file CCopasiXMLParser.h. Definition at line 3040 of file CCopasiXMLParser.h. Definition at line 757 of file CCopasiXMLParser.cpp. Definition at line 764 of file CCopasiXMLParser.cpp. 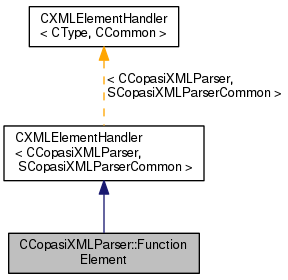 Definition at line 1011 of file CCopasiXMLParser.cpp. 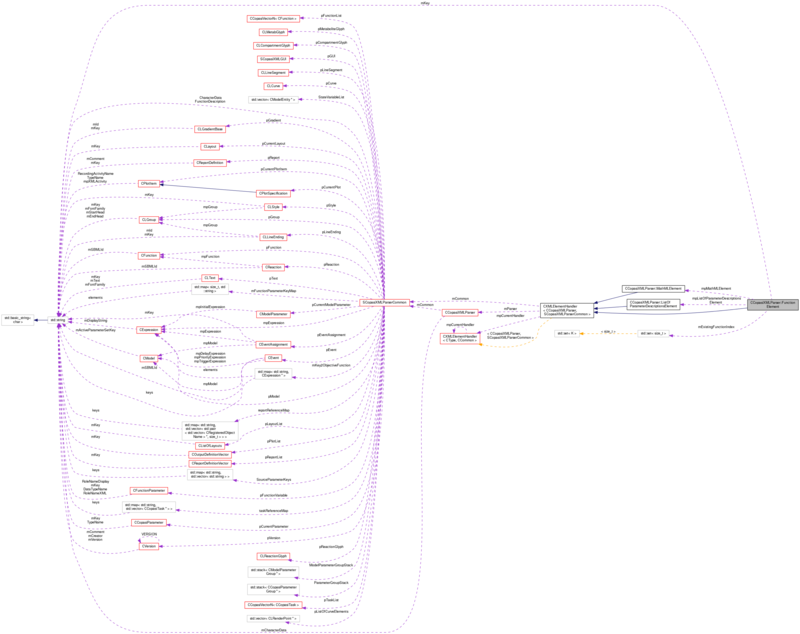 References CCopasiVectorN< CType >::add(), SCopasiXMLParserCommon::CharacterData, CCopasiMessage::EXCEPTION, CFunction::getKey(), CAnnotation::getUnsupportedAnnotations(), CFunction::getVariables(), CCopasiXMLParser::mCommon, MCXML, SCopasiXMLParserCommon::mFunctionParameterKeyMap, CExpatTemplate< CExpat >::mParser, SCopasiXMLParserCommon::mpExpression, SCopasiXMLParserCommon::mPredefinedFunction, pdelete, SCopasiXMLParserCommon::pFunction, SCopasiXMLParserCommon::pFunctionList, CFunction::setInfix(), CExpression::setInfix(), CAnnotation::setMiriamAnnotation(), CAnnotation::setNotes(), START_ELEMENT, and UNKNOWN_ELEMENT. 1157 // MathML is in place of Expression in old CopasiML files. Definition at line 770 of file CCopasiXMLParser.cpp. References C_INVALID_INDEX, CEvaluationTree::create(), CCopasiMessage::EXCEPTION, CEvaluationTree::Expression, CEvaluationTree::Function, CCopasiVectorN< CType >::getIndex(), CEvaluationTree::MassAction, CCopasiXMLParser::mCommon, MCXML, SCopasiXMLParserCommon::mFunctionParameterKeyMap, SCopasiXMLParserCommon::mKey2ObjectiveFunction, CExpatTemplate< CExpat >::mParser, SCopasiXMLParserCommon::mpExpression, SCopasiXMLParserCommon::mPredefinedFunction, pdelete, SCopasiXMLParserCommon::pFunction, SCopasiXMLParserCommon::pFunctionList, CEvaluationTree::PreDefined, CCopasiObject::setObjectName(), CFunction::setReversible(), toEnum(), TriFalse, TriTrue, TriUnspecified, UNKNOWN_ELEMENT, CEvaluationTree::UserDefined, and CEvaluationTree::XMLType. 836 if (Index != C_INVALID_INDEX) // A function with that name exists. Definition at line 3069 of file CCopasiXMLParser.h. Definition at line 3064 of file CCopasiXMLParser.h. Definition at line 3059 of file CCopasiXMLParser.h. Definition at line 3054 of file CCopasiXMLParser.h.